The terms salt and sodium often are used interchangeably, but sodium actually is an ingredient of table salt, which also contains chloride and iodine. Many foods, such as those that come from salt water like sea vegetables and seafood, contain significant amounts of sodium. The most common dietary sources of sodium are processed food and added table salt. Excessive salt intake can cause a range of side effects, including inflammation and high blood pressure. Sodium is an important mineral needed to maintain your electrolyte balance. It allows healthy transmission of nerve impulses and proper contraction and relaxing of muscles. Sodium also plays a role in maintaining the fluid balance in your entire body. Your kidneys are the main storage area for sodium and release it into your bloodstream as needed. Excess sodium is secreted in urine. When your kidneys can't eliminate excess sodium effectively or fast enough, the mineral accumulates in your bloodstream. Your blood volume then starts to swell because sodium holds water. As your blood volume increases, your heart has to pump harder to keep it moving through your veins and arteries, leading to high blood pressure. Left untreated, high sodium levels can lead to congestive heart failure, chronic kidney disease and cirrhosis of the liver. Salt intake exacerbates any inflammatory condition, such as arthritis, as your blood vessels expand. Swollen veins and arteries associated with high salt intake may place uncomfortable pressure on the surrounding joints. And rheumatoid arthritis puts you at a higher risk of developing hypertension, according to the Arthritis Foundation. Corticosteroids, commonly used to treat rheumatoid arthritis, cause you to retain sodium, so any extra salt you get from your diet only compounds your risks of developing complications. The average American diet contains close to 3,400 milligrams of sodium per day, according to the Centers of Disease Control and Prevention. Federal guidelines put a healthy amount at less than 2,300 milligrams if you're under the age of 50, or 1,500 milligrams per day if you're older than 50. If you have high blood pressure, kidney disorders or diabetes, you should keep sodium levels to less than 1,500 milligrams per day. African Americans also are encouraged to keep salt intake below 1,500 milligrams. Processed foods are the most common sources of excessive sodium. Manufacturers' recipes include salt as a primary ingredient, and many of the additives used as preservatives or taste enhancers have even more added salt. Vegetables, dairy and meat all contain natural sodium that adds to your daily intake. For example, one cup of milk contains about 107 milligrams sodium. You increase your sodium intake when you add table salt during cooking and again to season food after it's been served. 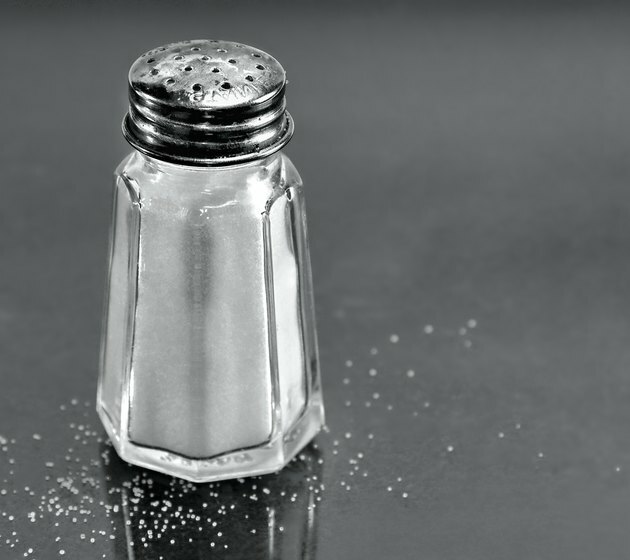 One teaspoon of regular table salt has about 2,325 milligrams of sodium. Sea salt, often touted for its health benefits, contains about the same amount of sodium. Where Is Sodium Found Naturally?